The Wasson Bluff site is designated under the Special Places Protection Act (1989) as a protected place that prohibits any collection of fossils or minerals without obtaining a Heritage Research Permit. The following work was carried out under an approved Heritage Research Permit (2015). The erosion of the coastal cliffs at Wasson Bluff provide an opportunity for discovery of new fossils, including new bones from Canada’s oldest dinosaurs. 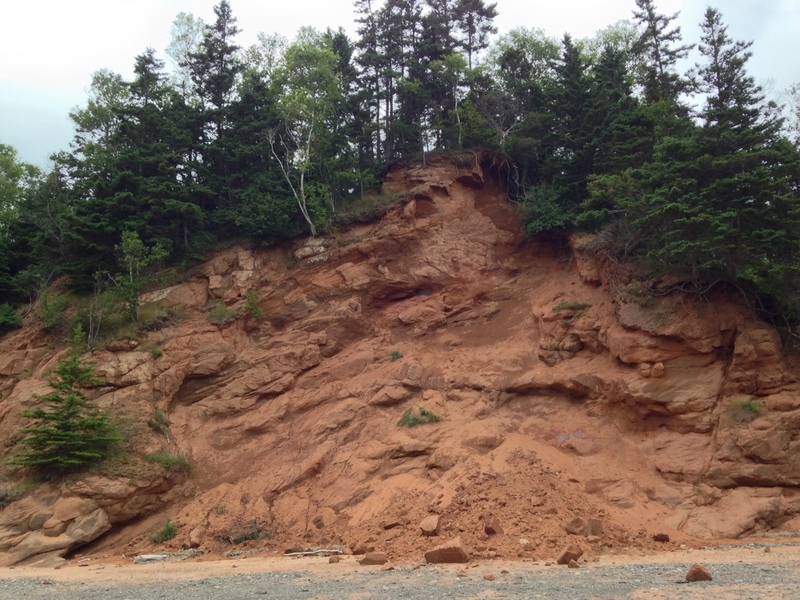 The site is monitored regularly by researchers at the Fundy Geological Museum. The monitoring and collecting of fossil material is justified due to the extreme richness of the site and importance for representing the time immediately after the global mass extinction that occurred at the end of the Triassic Period. Careful collecting of small vertebrate fossils provides an opportunity to establish a rich stratigraphic record of the animal diversity following the mass extinction event at the end of the Triassic Period. The ongoing erosion of the sandstone cliffs exposes a rich fossil record, including bones of dinosaurs, lizards (Clevosaurus), mammal-like reptiles (tritylodont and trithelodont), as well as semionotid (fresh water) fish and hybodont shark teeth and fin spines. To document the location (stratigraphic layer) of the fossils, researchers create drawings, maps and take photographs of the cliff. The location is then determined by measuring the height in meters from a base layer, such as the contact with the underlying basalt. Recent field work has begun to establish a new map of fossil bearing layers. Future work will also establish a high-resolution digital archive of the surface exposures and ongoing erosional processes. The information will be of value for studies of fossil material as well as identification of features related to coastal erosion during a period of climate change and rising sea level. 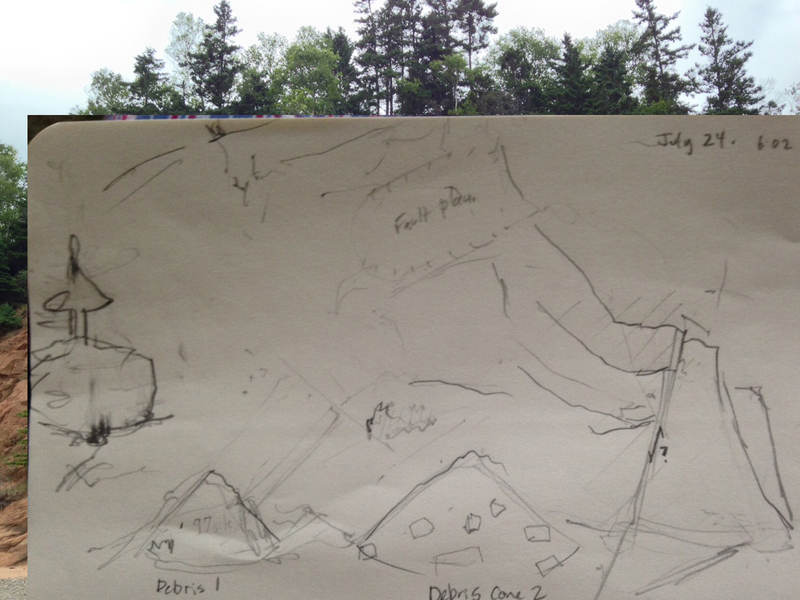 Scientists that do fieldwork often draw research sketches when conducting research. Researchers also use sophisticated photography and 3D scanning technology to document and study the coastal cliffs, but drawing is an activity that helps researchers observe important details. Below is an example of a recent field sketch done to document the piles of erosional debris at the dinosaur research site. Move slider across the image to see a field sketch and comparable photograph of the dinosaur bone bed strata and erosion debris visible July 2015. The coastal cliffs in Nova Scotia are actively eroding and caution should be used when walking near cliffs. Large scale collapse of cliffs can occur, but injury can occur from even a small rock falling from the cliff. Learn how to practice coastal cliff safety. Stay away from debris piles at the base of a cliff, as these signal increased danger due to active erosion.